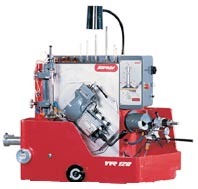 The SERDI VVR 120 has a variable speed for both valve rotation and grinding wheel rotation, for perfect surface finish on any material, including titanium, inconel. The ideal top-of-the range machine for performance and production shops. The SERDI VVR 120 is a centerless valve refacer. Unmatched versatility and accuracy for valve stems from 0.157" / 4mm to 0.787" / 20mm. Angle grinding range between 12 and 61 degrees.